I know what you are thinking. Avocado Chocolate Chip Cookies? Avocado in cookies? Yes. For reals. Trust me it’s so good! My husband made fun of me as I was mixing them up, but he partook in many of them! These Vegan Avocado Cookies made him a believer. Avocado makes everything better right? These healthy cookies are perfect for St Patrick’s Day. They have a slight hint of green and a minty flavor. So good! If you like healthy cookies, you may also like my Salted Caramel Flourless Cookies or my Flourless Snickerdoodles. These Avocado Chocolate Chip Cookies are vegan and gluten free. They have a rich texture and taste and are a great way to get some healthy fats in. 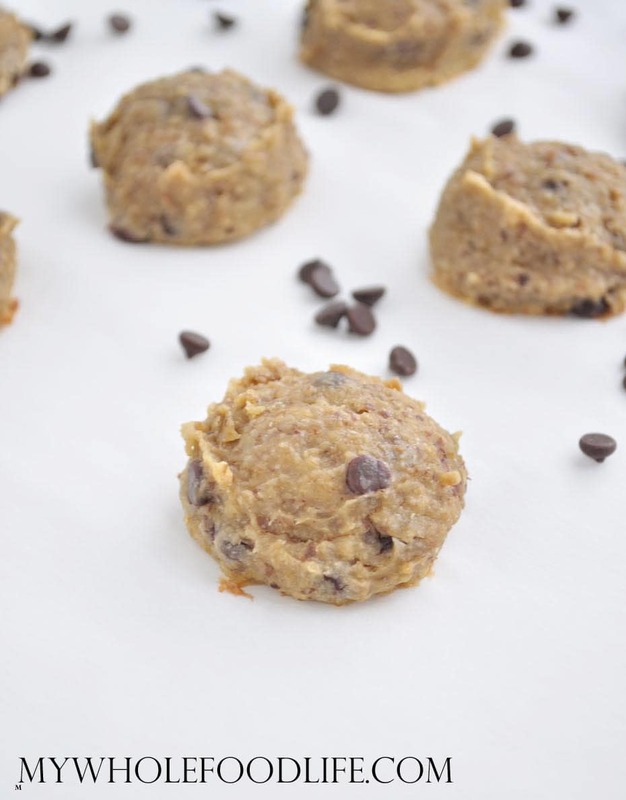 Healthy cookies made with a secret dose of healthy fats! In a food processor , combine the avocado, maple syrup, peppermint extract and vanilla extract. Blend well. Then add in all the dry ingredients and the flax eggs and process until smooth. Lastly, add the chocolate chips and pulse a few times to mix them in. Keep these cookies in the fridge. They should last a couple weeks that way. You can also freeze them for longer. Enjoy! Approximately how much avocado do you need? These cookies look moist and uncooked....is that how they look in person? They are in the oven for 12 min so does that give them a "baked" look or do they need to be left longer in the oven to obtain that browned, baked cookie look?? The photo isn't the best, but I promise they are fully cooked. It's just the lighting in the photograph. Oh OK. thanks so much for clarifying that!! it should be great recipe and i am going to bake it tomorrow or this weekend, i just bought all the ingredients!!! Thanks again for a great, healthy, cookie recipe that we can feel good about!! !